The era of virtual reality is upon us, and while there a growing number of solutions aiming to bring VR into the home, Google Cardboard’s approach is unique in that it is an extremely affordable way to get your VR fix using nothing more than a simple VR headset, your existing smartphone, and any Google Cardboard compatible app. So what exactly is Google Cardboard, where do you get it, and how do you use it? Those are the questions this guide aims to answer. 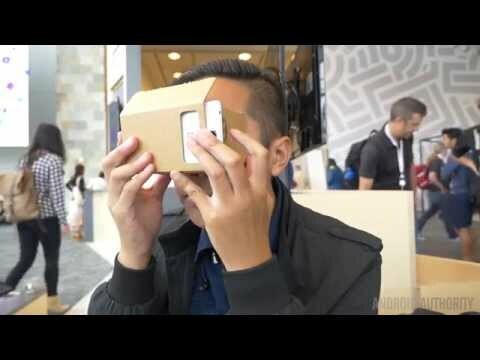 Simply put, Google Cardboard is a virtual reality platform. Google creates a basic spec for “Cardboard compatible” viewers and apps but doesn’t actually regulate or sell either of these things. Since there’s little to no regulation on the viewer designs sold, there are a ton of different viewers out there. While the “default” model is in fact made of cardboard, there are variants that come in plastic, foam, and other materials. As for how Cardboard works? Basically an app splits an image on your phone’s screen into two. You then insert your phone into a reader, and using two special lenses, you are given a 3D VR type affect might pale in comparison to high-end VR experiences like you’d find with an Oculus Rift, but is actually pretty impressive considering the low-key investment here. Controlling the games is done a few different ways, but most commonly you interact by looking at things long enough to select them. You can also look around the VR world just as you would in the real world, by moving your head. Some viewers and apps do support extra input methods like triggers on the viewer, Bluetooth controllers, etc, but these methods of control are less common at this stage. Is Google Cardboard worth buying? Merge VR is one of the more “premium” Cardboard viewers out there. Before you decide to jump into the wonderful world of Cardboard, keep in mind you’ll need a phone that runs Android 4.1 or higher. Thankfully, that shouldn’t be a problem for almost everyone these days. It’s also worth mentioning that some Cardboard viewers are designed with smaller phones in mind, while others support up to 6-inch displays, so keep that in mind when deciding which viewer is right for you. VR Source Google Cardboard – Priced at $12.99 you get a cool looking Google Cardboard v2.0 unit! JoyGeek 3D Cardboard – This model has a strap, a plastic design, padding comfort while wearing, and several other enhancements that set it several levels higher than the first two viewers on the list. At $21.90, it’s still extremely affordable too. And there’s even a remote that can be purchased optionally for around $17. View-Master Virtual Reality Starter Pack – This one is billed more as a toy, and follows the iconic design of the View-master reel viewers that many of us owned as kids. That said, it is fully compatible with Google Cardboard apps and even has some cool extras like support for its own AR “discs”. At $19.10, it’s once again light on the wallet. IncrediSonic M700 VUE Series VR Glasses – Another plastic viewer that’s fully compatible with Cardboard apps. At $43.95, this one is much pricier, but it does have a Bluetooth controller that will allow you better interaction with games that support in. Unfortunately, there really aren’t that many games that do, but this number is starting to grow. Merge VR – At $100, this unit is honestly way too expensive, especially when Samsung Galaxy S6, S6 Edge, Note 5, GS7, and S7 Edge owners can get a Gear VR unit for the same price and the Gear VR is much more capable (Gear VR is NOT designed with Cardboard apps in mind however). That said, Merge VR is one of the most comfortable solutions out there, made of foam that feels great and is light. Merge VR is also fully Cardboard compatible, and has its own SDK that will eventually yield cool apps. But for now? The Merge VR has a lot of promise, but you’re probably better off getting something cheaper, unless comfort is of utmost importance to you. Okay, so you now have a Cardboard ordered. How do you actually use it? The first thing you’ll want to do when your headset arrives (or you build it) is download the official Google Cardboard app. This is a great starting point, as there is an easy setup guide as well as a portal for finding apps and other Google Cardboard experiences. Aside from the Google Cardboard app, we also have a list of recommended apps to check out that are built with Cardboard in mind. Also don’t forget to check out Youtube, which has an extensive library of VR videos that you can watch with your Cardboard viewer. A final word of caution: some apps can’t be found simply by using the official Cardboard app. So if you’re looking for more Cardboard experiences, try hitting up the Google Play store and searching for terms like “VR” and “Cardboard”. You could find some gems in the process. Ultimately, Google Cardboard is a bit like the wild west of VR, but with its relatively low entry price, and the fact that the majority of apps are free or cheap, we highly recommend at least picking up a base viewer to get a taste of VR before diving into something more expensive like the Oculus Rift, HTC Vive, Playstation VR, or even the still quite affordable Gear VR.